WASHINGTON • The US Federal Aviation Administration says it will order the inspection of about 220 aircraft engines as investigators have found that a broken fan blade touched off an engine explosion this week on a Southwest Airlines flight, killing a passenger. The regulator said late on Wednesday that it plans to finalise the Airworthiness Directive within the next two weeks. The order, which it initially proposed last August following an incident in 2016, will require ultrasonic inspection within the next six months of the fan blades on all CFM56-7B engines that have accrued a certain number of takeoffs. Airlines said that because fan blades may have been repaired and moved to other engines, the order would affect far more than 220 of the CFM56-7Bs, which are made by a partnership of France's Safran and General Electric (GE). The CFM56 engine on Southwest Flight 1380 blew apart over Pennsylvania on Tuesday, about 20 minutes after the Dallas-bound flight left New York's LaGuardia Airport with 149 people on board. The explosion sent shrapnel ripping into the fuselage of the Boeing 737-700 plane and also shattered a window. Bank executive Jennifer Riordan, 43, was killed when she was partially pulled through a gaping hole next to her seat as the cabin suffered rapid decompression. National Transportation Safety Board chairman Robert Sumwalt said he could not yet say if the incident... pointed to a fleet-wide problem in the Boeing 737-700. An NTSB inspection crew is combing over the Boeing 737-700 involved in the latest incident for signs of what caused the engine to explode. Other passengers pulled her back inside but she died of her injuries. Philadelphia's medical examiner said the cause of death was blunt trauma to the head, neck and torso, and ruled the death an accident. National Transportation Safety Board (NTSB) chairman Robert Sumwalt on Wednesday said the incident began when one of the engine's 24 fan blades snapped off from its hub. Investigators found that the blade had suffered metal fatigue at the point of the break. Mr Sumwalt said he could not yet say if the incident, the first deadly airline accident in the United States since 2009, pointed to a fleet-wide problem in the Boeing 737-700. 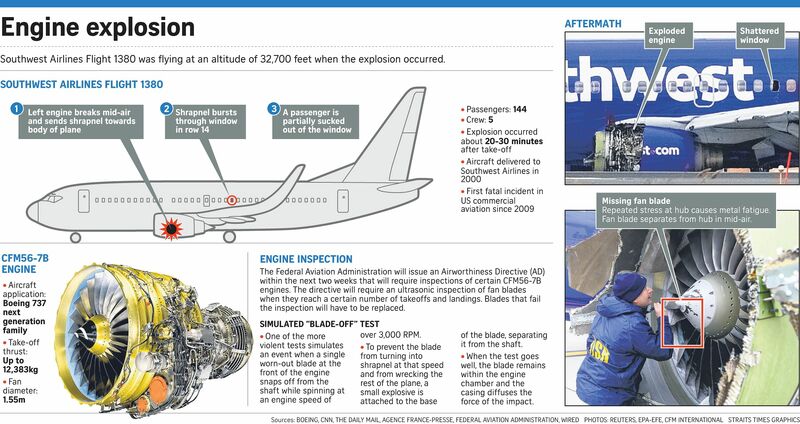 An NTSB inspection crew is combing over the Boeing 737-700 involved in Tuesday's incident for signs of what caused the engine to explode. Mr Sumwalt said the fan blade, after suffering metal fatigue where it was attached to the engine hub, has a second fracture about halfway along its length. Pieces of the plane were found in rural Pennsylvania by investigators who tracked them on radar. The metal fatigue would not have been observable by looking at the engine from the outside, Mr Sumwalt said. Southwest crews are inspecting similar engines the airline has in service, focusing on the 400 to 600 oldest of the CFM56 engines, according to a person with knowledge of the situation. In 2016, a Southwest flight made a safe emergency landing in Pensacola, Florida, after a fan blade separated from the same type of engine and debris ripped a hole above the left wing. The airline expects to wrap up its inspection of the engines it is targeting in about 30 days. The GE-Safran partnership that built the engine said it was sending about 40 technicians to help with the inspections.